Because silver is highly sought after for its properties, which make it eminently suitable for new technology applications, a clear understanding of the flow of materials in the economy, the historical context, and trends for the future can help project the future of silver in the economy of the United States. Silver has many properties that are desired in today’s economy. It has superior electrical and heat conductivity, chemical stability, high-temperature strength, malleability, and other characteristics that make it important in high-tech electronic and other industrial applications. Because it is relatively scarce as a natural resource and is easily coined, silver historically has been an important monetary metal. As knowledge of silver chemistry has increased, many industrial end uses have been developed. This study reviews the flows of silver into various end uses and examines the nature of the end use with respect to the silver properties desired and the ability of the end use to produce recyclable end-of-life materials. For the most part, silver can be profitably recycled, but the recycling activity is helped by tipping fees (fees imposed on scrap generators by scrap collectors for taking the material) for materials that might otherwise be regulated as hazardous wastes. New high-technology applications use silver in nanolevel amounts, leading to a potential for dissipative loss and reduced recycling capability. 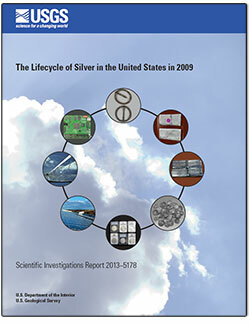 Goonan, T.G., 2014, The lifecycle of silver in the United States in 2009: U.S. Geological Survey Scientific Investigations Report 2013–5178, 17 p., http://dx.doi.org/10.3133/sir20135178.